It’s the question every adoptive parent expects – “Why Don’t I Look Like You?” It’s just another way for your son or daughter to ask “Where do I come from?” or “Am I really your child?” But long before younger children have any real notion of what adoption is, they will notice physical differences between themselves and you, their adoptive parents. And long before they verbalize their curiosity, they are already having these thoughts running through their mind. Children usually look kind of like their birth parents. So when your adopted son or daughter starts to notice that they don’t look like you, it begins to raise some questions in their mind. Sometimes these differences are subtle. Sometimes they are more glaring. Either way, you have to be prepared for the possibility that your child will have questions. Even if your child doesn’t approach you, it is easier and healthier to have the conversation with them when they are younger. Most toddlers and grade school-age children are very accepting of what their parents say and the attitude in which they say it. Feelings about being adopted can influence a child’s sense of self-esteem and worth, especially later in life. Learning later in life that he/she is adopted can lead to feelings of abandonment and rejection. So it is important to approach the subject in a positive way. When you talk to your child about adoption, there are six points that you should be sure to have as a part of your conversation. Yes, you were adopted. Being honest is essential. Adoption is a normal way for families to grow and is something to hold with pride. You are loved by two sets of parents. You were born to a mother and father, just like every other kid. There was nothing that you did to cause your birth parents to place you for adoption. Always speak of the birth parents in a positive and respectful way. Remain open to talking about the subject and let your child know that they should never be afraid to approach you if they have any further questions. These six simple points help lay the groundwork for your child’s adoption story and support a positive development of your child’s life as an adoptee. While some aspects may be too complex or mature for them at a younger , opening the dialogue will help make future conversations much easier to handle. 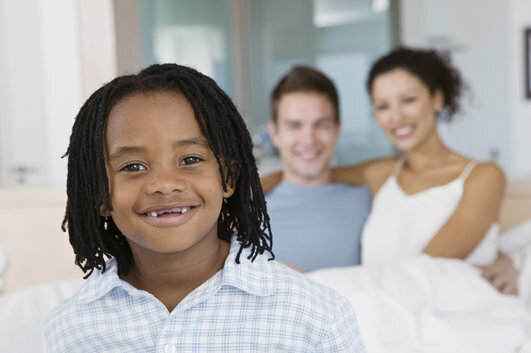 If you have any questions about how to talk to your child about adoption, you can contact us by e-mail – dr.kirschner@adoptionmakesfamily.org – or use our online contact form. Adoption Makes Family was founded to meet the needs of birth parents and adoptive parents in a manner that is sensitive, compassionate, and personal. This entry was posted on Wednesday, September 30th, 2015	at 4:58 pm	. You can follow any responses to this entry through the RSS 2.0	feed. Both comments and pings are currently closed.